A knee scooter is a four-wheeled mobility device that is designed to support the shin or an unusable limb, with the opposite foot being used for propulsion with handlebars designed for maneuverability. The knee scooter is ideal for those who have a leg brace or are required to limit their scope of movement on a particular joint. A knee scooter is an alternative to the crutch, with it being the ideal solution for those who are recovering from knee surgery, a sprained foot, or a diabetic ulcer. Even though it offers superior mobility compared to other devices, a knee scooter may not be suitable for those who have injuries or movement limitations to areas above the knee. Due to the nature of its wheels and design, a knee scooter is not suitable for those who need to climb stairs, with the weight of the scooter making it inappropriate to do so. Lighter materials like aluminum are commonly used, but it is not safe to carry a scooter if you are still recovering. Both assistive devices are viable solutions for short-term rehabilitative purposes, as it allows a joint, bone, or injured skin to stay static and eventually heal. Knee scooters, compared to crutches, offer superior mobility – since they are lower to the ground, they tend to be more stable and safer than traditional crutches. Both mobility devices have a learning curve, with a knee scooter arguably requiring more contact time than a pair of crutches. However, once the steering is figured out, it quickly becomes intuitive. Knee scooters are simple to use and don’t require the upper body strength demanded by traditional crutches either. You can move a lot faster on a knee scooter than crutches or a wheelchair that will limit the use of your hands. It is a lot easier and intuitive to travel larger distances on a knee scooter, with inertia allowing you to go farther with less mechanical input for momentum. These mobility devices also lower the chances of you re-injuring your ankle or leg. One of the overlooked realities of traditional crutches or a wheelchair is that it significantly limits your ability to reach for items. Even though it may not be a big deal, a knee scooter elevates you to reach for items on a shelf or counter easily. Crutches make it particularly difficult to balance yourself while you reach for an item, while wheelchairs will demand that you exert energy. The Essential Medical Knee Scooter gives you superior movement, with a 30 percent turning radius. Even though compact and standing up at the height of 17 1/4″, this knee scooter can accommodate up to 400 pounds and people between 5’4″ and 6’6″. Designed for those who are recovering from surgery or injuries, the Essential Medical Knee Scooter allows your limb to be supported without strain that will undermine the recovery process. It derives many of its mechanical elements from the recreational scooter, with loop hand brakes and even a vinyl pouch to store your personal belongings when out and about. Lightweight frame easily collapses and folds into itself for easy transportation and storage. Other mobility scooters have the entire frame bend when turning – the Essential Medical Knee Scooter only has its wheels turn, like a traditional scooter. The KneeRover Knee Scooter uses a tie rod steering mechanism, similar to the ones used in recreational scooters. However, it is designed for maximum stability and control, ideal for those recovering from foot or ankle surgery. Its robust frame is not only viable for indoor use, but outdoor use as well. Fixed with 7.5-inch wheels and a pad that is 3.5 inches thick, the KneeRover scooter is comfortable, regardless of which leg is injured. The KneeRover Scooter comes with a free basket, giving you the opportunity to drop personal items into it as you use the knee scooter to get from point A to point B.
It’s a stable knee scooter right out of the box, with a top frame, secure welds, quality fold clamps, and polyurethane wheels absorbing small bumps on the floor. At just 20 pounds, the scooter is compact yet does not sacrifice on its ability to accommodate up to 300 lbs. The knee pad on this medical device is 6.5 inches wide, supporting not only your leg but also the cast that it is in. The Isokinetics Knee Scooter comes with everything that you expect from a knee scooter – and then some. Outside of its ergonomic design that allows it to support your lower leg, the Isokinetics Knee Scooter has a removable basket, wheels that will not skid your hardwood surfaces, brakes that lock into place, and a bell to notify those around you. The locking brakes on of the Isokinetics Knee Scooter gives you the opportunity to sit on the cushion and lock the scooter into place, giving you the security of knowing that the bike will stay stationary while you rest. The scooter’s adjustable steering column doesn’t need additional tools for it to be adjusted. Variable brake speeds allow your Isokinetics Knee Scooter to gradually come halt or to stop in a pinch. The Isokinetics Knee Scooter uses a series of drum brakes, offering excellent maintenance and a better response to your input. Steel frame accommodates up to 300 pounds. The Isokinetics Knee Scooter folds into itself for a compact size without any additional tools. Going back to KneeRover’s lineup of scooters, their all-terrain model offers robust maneuverability with taller, thicker wheels that make for an excellent alternative to a wheelchair or crutches. 12-inch tires not only make the All-Terrain Knee Scooter perfect for indoor use, but it is also a strong tool for those who want to use it outdoors. The taller, thicker tires also allow it to absorb impact while in use on the curb. At 27 pounds, the All-Terrain Knee Scooter may be a bit heftier than its slimmer counterparts, but it can accommodate for larger people. This model has a weight capacity of 400 pounds. Indoor and outdoor use. Its robust braking system and the larger wheels will find its place in your home or when traveling outdoors. Compatible with both legs with a three-inch thick knee platform for support. A thumb release lever is all you need to fold the All-Terrain Knee Scooter for storage. The new 2017 reiteration of the popular Vive Knee Scooter now comes fixed with two fold points as well as a removable seating for easy storage and traveling. Even though small, the heavy-duty steel frame is set with eight-inch polyurethane wheels. Polyurethane is superior to other types of plastics, due to its ability to grip onto surfaces. This gives you more security when using the Vive Knee Scooter. A walker bag is fixed onto the front of the Vive Knee Scooter, big enough for larger items like a notebook, medication, and other personal items. The adjustable handlebars on the Vive Knee Scooter reach every extreme, accommodating those between 4’5″ and 7’0″. 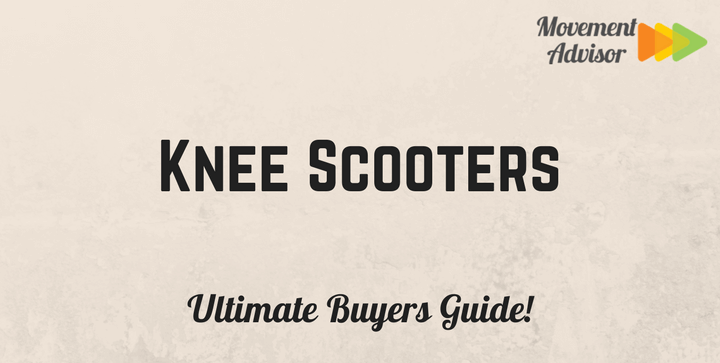 Knee scooters are the perfect fit for those who are in their final stages of healing. It may not be suitable for reconstructive surgery or broken bones located above the knee, since your thigh will bear most of your weight when maneuvering on a knee Scooter. The right knee Scooter will give you a new sense of freedom, allowing you to be more independent in and outside of your home.